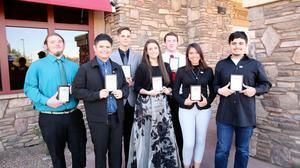 On November 16, 2018, students from Hemet Unified and San Jacinto Unified were recognized as Students of the Month at an awards breakfast held at the Sizzler Restaurant in Hemet. Students were selected from Hemet High School, West Valley High School, Tahquitz High School, Hamilton High School, Helen Hunt Jackson College Prep High School, Western Center Academy, San Jacinto High School, and Mountain View High School/Mountain Heights Academy. Sponsors of the Student of the Month Program donated backpacks filled with gifts, gift certificates, a plaque, and much more. The students had an opportunity to thank their families and teachers who have supported them and helped them plan their future life goals. Brenden Burns was nominated by Mrs. Foley, his English teacher at Hemet High School, for his ability to change his trajectory and find direction. Brenden is currently a football player and maintains a 3.0 GPA. Brenden has been pre-accepted into the Navy’s Engineering program and is excited to pursue this after high school. Daniel Hernandez was chosen as West Valley High School’s Student of the Month by his AP History teacher, Kevin Smith. Daniel was unanimously selected by the social science department for his resilient and empathetic nature. Daniel had dreams of playing soccer, but after an injury he was forced to find a new dream. Although his injury changed his plans, it led him to new career opportunities. He plans to attend college and become a physical therapist. Kevin Talla was nominated by his teacher Stacey Haar as Tahquitz High School’s Student of the Month. Kevin was nominated for being a hard-worker and being dedicated to his education. He has taken 11 Advanced Placement classes, a Dual Enrollment Political Science class, is in the Marching Band, and multiple clubs. He hopes to attend a University after high school and major in psychology. James Leaf was selected by his teacher Mary Kleinvachter to represent Hamilton High School as their Student of the Month. James was nominated for his dedication to his education after not seeing the value early in his high school career. James said he didn’t attend school very often, but now comes to school ready to learn. He plans to move to Indianapolis to attend a community college and become an electrician. Jaqueline Moran was nominated by her teacher, Juliana Hoy as Helen Hunt Jackson College Prep High School’s (HHJCPHS) Student of the Month. Hoy nominated Jacqueline for being a model Independent Study student. She said Jacqueline is highly motivated and has been a pleasure to work with. She transferred to HHJCPHS with a 1.6 GPA and now has a 4.5 GPA. She plans to attend Mt. San Jacinto College to complete her general education and then transfer to a University and become a veterinarian. Matthew Eskin was selected as Western Center Academy’s Student of the Month by his math teacher Bryndle Valadez. Matthew began attending Western Center Academy when he was in sixth grade. Staff chose to recognize Matthew for the growth he has made since entering as a sixth grade student. Matthew has Asperger’s and was uncomfortable speaking to his classmates or to his teachers unless it was one-on-one. When he entered high school he pushed past his anxiety to become more social and involved with students on campus. He plans on attending University of California Riverside, California State University, San Marcos, or University of San Francisco to further his education. Congratulations to the students, teachers, principals, and family members. It was an inspiring morning celebrating these students and their bright futures.